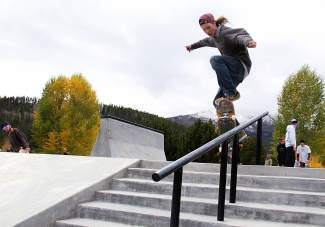 Beau Bynum of Keystone slides a rail at the newly renovated Breckenridge Skateboard Park. The park recently underwent a complete redesign and reopened Oct. 1. The new park includes more flow between features and has been described as now being one of the best in the state. The Breckenridge Recreation Center will have an official grand opening next spring, but it is currently open to the public as conditions allow. There was no official grand-opening ceremony, but the word is out. The newly renovated Breckenridge Skateboard Park is open for business — at least until the snow comes — and so far it’s already a big hit. And while the old park wouldn’t have supported those numbers, the new interconnected design can easily manage that kind of traffic. It also doesn’t hurt that the overhauled park is more than twice the size of the original. Barr and two other friends recently formed The Trilogy event management company and are excited about the opportunity to bring more skateboarding competitions to Summit County next spring. The recreation center took down fencing encircling the newly completed, $650,000 redesigned park last Wednesday, Oct. 8, giving skaters a few weeks to enjoy the park before the snow comes. The project was the result of a grassroots effort by the local skate community that was approved by town council and financed with capital allocation funding. The renovation was completed by renowned park designers Team Pain Skate Parks, which also designed the original park close to 20 years prior. Parker said the rec center and the town of Breckenridge will have an official grand-opening ceremony next spring when the snow melts. In the meantime, the rec center announced Tuesday evening that it will host a few late-season after-school sessions next week. With warm weather and no storms in the forecast, Parker said the park will be able to offer a few days of drop-in sessions for kids ages 6-12. Sessions will be $12 per day and will be offered next Wednesday through Friday, Oct. 22-24. He encouraged those interested to contact the rec center for more information and to sign up. The park will stay open as long as there is no snow on it. Parker asked that anyone who might consider using the park in the wintertime avoid using metal shovels to clear snow, as they can damage the concrete.